With its audio-visual production, the Instituto Itaú Cultural is creating one of the most important legacies of Brazilian art and culture. With the implementation of Cantemo Portal, the ongoing preservation of this legacy can be ensured. KARINA FOGAÇA, AUDIOVISUAL EDITOR, ITAÚ CULTURAL. The Instituto Itaú Cultural is an important cultural reference center in the heart of Brazil. Founded in 1987 and based in São Paulo, the Instituto Itaú Cultural promotes the value of Brazilian culture through research, production of content, and by encouraging and disseminating artistic and intellectual works, both within Brazil and across the globe. The institute is open to the public, with visitor numbers surpassing 300,000. Instituto Itaú Cultural houses a vast array of media content, including video, audio, and stills, in both HD and SD. Amongst its archives is a vast catalogue of virtual encyclopedias of Visual Arts, Theatre, Brazilian Literature, and Art and Technology, all translated into Spanish, French, and English. Every year hundreds of video clips are produced. The institute recently began digitizing the archived collection, as well as continuing to create new digital HD content. With all this content, in varying formats, the institute’s central storage was full to bursting, with media files spread into both internal and external drives. And the media keeps coming in, with the organization continually creating and collating further media content in a variety of formats. Add to this the fact that the institute makes the video content available to visitors, the need for a better system to both store and catalog it was apparent. Therefore, together with partner Drivesys, a Brazilian systems integrator, focused on the Broadcast, Production, and Post-production market, Cantemo Portal was selected to effectively manage all of that content. With such a vast array and range of content in several different formats, Instituto Itaú Cultural needed to adopt a complete solution that meets all stages of the archive. Drivesys worked closely with the institute to determine how the video content would be viewed in order to plan the necessary metadata fields for seamless categorization, as well as defining rules and access permissions according to their rigorous specifications. It was clear that as well as needing the video assets for internal review and reference, the biggest part of the institute’s aim is the dissemination of that content, both to visitors and through other channels on a global scale. 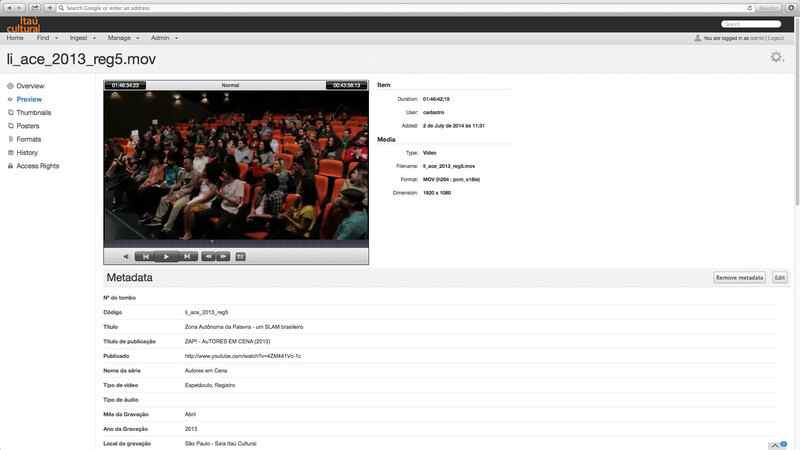 Indeed, one of the biggest challenges for Instituto Itaú Cultural, was that with so many different assets, locating the relevant video was an arduous task and meant the institute was also unable to offer a natural viewing experience for visitors wishing to access video content, as well as for their own internal needs. Due to very intensive audio-visual production, along with the vast increase of media variety and quality, managing media located in several external drives and cataloging these assets on a simple database without preview features or metadata information, was becoming unbearable. Cantemo Portal brings us a great solution by adding a metadata search system tailored to our needs, and also the management and visualisation of these assets in another type of storage, LTO. KARINA FOGAÇA, AUDIOVISUAL EDITOR, ITAU CULTURAL. With the information gathered from the initial consultation by Drivesys, the team was able to create the necessary metadata for categorization of the video assets, even before gaining access to the central storage. This meant that once it had access to the storage, it was ready to simply catalog the assets into Cantemo Portal, without needing to copy or re-ingest files, or even type the metadata. Thanks to the detailed and intelligent application of metadata, the team at Instituto Itaú Cultural is able to continually create placeholders, allowing easy and quick access to each individual video asset. Permissions can also be assigned to each individual asset, especially important given that many of the videos are made available for public viewing. Cantemo Portal™ also enables them to edit that metadata, something which was particularly important due to the large volume of additional content still being created every year. As mentioned above, the other major challenge for Instituto Itaú Cultural was the sheer volume of content and a full-to-bursting storage system. Therefore, to handle the capacity issues, Drivesys deployed an automated tape library, providing the institute with around 100TB of storage, freeing up space in their production storage, and future proofing their storage needs. As well as that, Drivesys implemented additional storage with 8TB Thunderbolt DAS, 6TB internal drives and 5TB external USB drives, enabling easy additional flexible storage and access. Being able to integrate with the LTO archive through Archiware P5 was also crucial, as Instituto Itaú Cultural holds a great deal of legacy video assets. Therefore, Drivesys implemented a plugin developed by Moosystems, meaning that the institute can manage and access all of its video assets, including the LTO archive, within Cantemo Portal. Cantemo created a natural and usable interface, which was given a custom theme in line with Itaú Cultural branding. 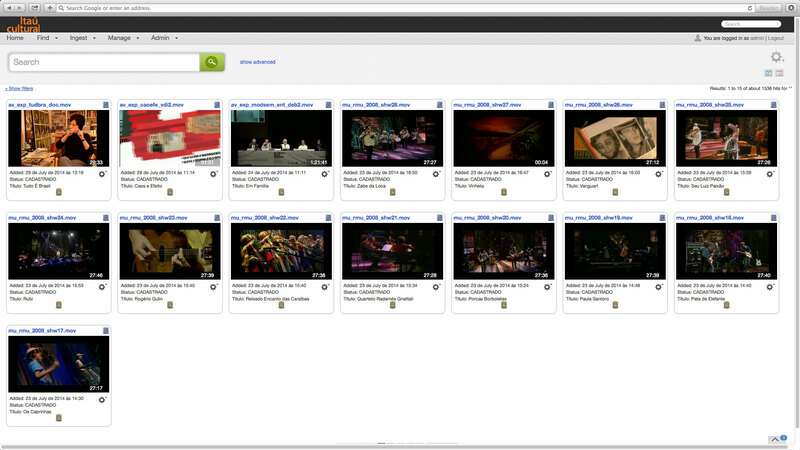 Users can easily view thumbnails with details about the video assets and search within the portal. The project was successful, delivering a great and useable tool to Instituto Itaú Cultural. Cantemo®, together with its partners Drivesys and Moosystems, has enabled Instituto Itaú Cultural to overcome a number of significant challenges and ensure the continued and effective success of its important work, creating a legacy of Brazilian culture. DWe are pleased to be partnering with Cantemo and with the outcome of this project, where we have been able to deliver a tailored solution for the needs of Instituto Itaú Cultural. Cantemo’s intuitive and streamlined media management solutions enable us to continually deliver a truly compelling offering to our customers.